There have always been rafts of dinghies and open boats, runabouts, centre consoles, cuddy cabins and - the big deal in recent years - omnipresent bowriders to choose from. But what about the traditional half cabin? A big deal when this writer was an aspiring boat owner, I'd often dream of owning a half-cabin boat like, say, the old Pongrass Waverider advertised betwixt the pages of my well-thumbed Angler's Digest magazines. Such boats seemed like great things at the time. Though Pongrass and Anglers Digest have long been confined to history, it appears the good ol' half cabin is staging a Lazarus-like comeback. Realising that at least some of us appreciate the comforts of a cabin, Australia's biggest trailerboat builder, Telwater which makes Stacer and Quintrex boats, is now offering these family-friendly boats among its range of Ready 2 Go drive-away tinnie packages. While it still builds many more dinghies or dories, runabouts and, yes, bowriders in its annual production run of some 6000 boats a year, Stacer is now offering a smart range of half-cabins that should find favour with family boaters who like to do a bit of everything from fudging about to fishing. 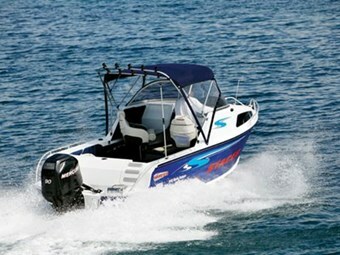 Of the five models in Stacer's cabin-boat series, one of which is a centre cabin, the 549 Wave Runner tested here is perhaps the handiest for mixing it up, for a spot of inshore and offshore fishing, some skiing and flat-water river running, carrying the kids and bundling them in the cabin for a catnap. It’s also an easy boat to tow behind the family car. Though produced en masse, Stacer backs its tinnies with a three-year warranty. Just as importantly, it builds trailers that are model-matched. Packaged with a V-Loader trailer with brakes and 75 to 90hp outboard, the 549 Wave Runner weighs less than 1000kg on road. Its 4mm sheet aluminium hull bottom and 2.5mm on the top sides lead to an all-up boat-only weight of 649kg. As with all Stacers, there is positive foam flotation - which is nice to know when you venture offshore - a flat carpeted floor, high sides and plenty of grabrails. However, the foam in the hull sides comes at the expense of storage in the sidepockets. If you value safety, it’s a small price to pay. A two-stroke 75hp outboard is recommended and part of the standard Ready 2 Go package, however, the hull is rated up to a 125hp outboard. Thanks to the so-called Mod Pod, there's plenty of buoyancy to support the bigger engine and crew weight back aft. Going one better, the new Sydney Stacer dealer, Andrew Short Marine, went for an engine upgrade with a family-friendly four-stroke 90hp Mercury outboard. There were other options as well, namely a rocket launcher to provide rod storage where otherwise there is none, dual batteries, a transom door, livebait tank and two-tone paint. There is also a Maxi Bracket on the transom that lets you switch from swim ladder to berley pot in the blink of an eye. Pretty much everything else comes standard in the NZ$48,640 drive-away package. Despite its half cabin, the 549 Wave Runner has brilliant access to the bow, which is quite unlike ye half-cabs of yore with their nogging-knocking small hatches. 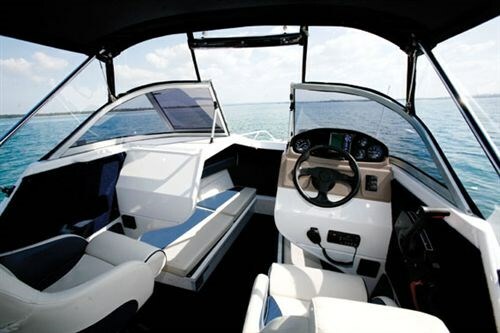 Open the centre pane of the wrap-around windscreen and the big deck hatch that hinges across, and you have full walkthrough access to the bow. When you lean forward to deploy the anchor, there is a neat rounded leading edge and the sense of freeboard up front at sea is nice and reassuring. My only gripe: the catch for the hatch is a tad fiddly to operate, especially at sea if you’re feeling green around the gills and want to hastily retrieve the anchor. The bow is headed by a small bowsprit with a roller, a short split bowrail to which you could lash a rope, and there's a rotomoulded plastic anchor well that will help reduce rattles. Lined with front-runner, the cabin is bigger than you might imagine on an 18-footer. There are windows for natural light and to enhance the looks, padded backrests that double as facias for short sidepockets, a deep footwell in which you could carry a tub, plus dry storage under the four basic vinyl-clad cushions. A couple of anglers will find just enough headroom to sit in the cabin and ride out some rain, but with an infill one person could actually catch 40 winks on a lazy Sunday. Doubtless the kids will enjoy the cabin just as it is. Full marks for the cover over the wiring behind the dash. The cabin height and wrap-around windscreen, held up by aluminium-and-plastic struts that I have seen falter before, offer plenty of protection at the helm. The tinted windscreen is a moot point, as the view forward might be compromised if you also wear dark sunglasses. But with a bimini and clears fitted (as per the demo boat) the 549 Wave Runner is set up for fair and foul weather boating. Although crosswinds and beam-on seas invariably lead to spray, at the helm on this boat you’re nicely protected. Under the canopy, with the clear centre sections zipped down, I also noted at least 1.85m of headroom. The co-pilot or navigator gets a grabrail and drinkholder and, along with the skipper, a high-backed swivel seat that seemed secure enough. The moulded dash has come a long way since the days of angled aluminium and not much more. The 549 Wave Runner is bundled with a basic Navman Fish 4433 DF DST sounder, but there's a factory upgrade to a Lowrance unit if you want better fish-finding ability. The boat also comes with a 27 Meg radio and a spread of Mercury engine gauges including speedo, tacho, trim and fuel, plus a Ritchie compass, drinkholder and more built into the dash. And the sight lines are great for driving on your feet or seated. Fully carpeted, the cockpit is a decent size but, obviously, not as big as the other configurations of trailerboats without cabins. Although overhead casting space is compromised by the raked rocket launcher that stores five fishing outfits, given the size of the sidepockets, which are partially filled with foam flotation, the launcher is a must. Stacer is to be commended for making the most of the underfloor area on this 18-footer. Besides a modest 118lt fuel tank - plenty with the four-stroke outboard - there are two large rectangular rotomoulded storage bins with bungs. You could use one for the catch and the other closer to the helm seats for bait/lunch. The 549 Wave Runner comes with a removable three-seater aft lounge, flanked by aft deckrails that double as handholds. Access to the twin batteries, battery switch and fuel filter is behind the lounge. And thanks to the deep outboard pod it's virtually impossible to put water over the transom. There are also a couple of plastic rod holders and, as touched on earlier, a Maxi Bracket that lets you switch from swim ladder to berley pot. You can also get a ski pole/cutting board. Though factory fitted with a livebait bin with pick-up, it is only a small container suitable for keeping nippers alive and not much more. 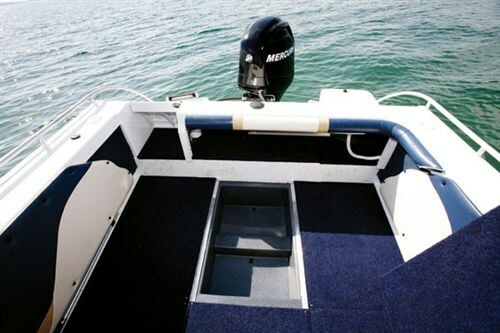 The optional starboard-side transom door and swim ladder improve access to the water or beach, however, it must be said, I have a real issue with the lack of access to the bilge on this boat. Both the dealer and I couldn't get into the bilge where, I assume, there's a pump with float switch. Thing is, bilge pumps often get clogged and, should that be the case, you are rendered helpless on this boat. You can't even get a bailer in there. A rethink is needed. 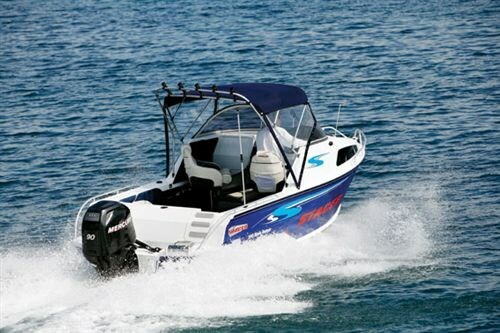 The hull is what Stacer calls an EVO II, which is an evolution of its standard moderate-vee hull. It’s very easily driven and glides to planing speed, but perhaps the greatest surprise was just how well it travelled offshore, with its sharp forefoot really slicing the waves without the usual pounding I expect in a tinnie. During my travels, the half-cabin remained dry and its motion was at all times and in all directions very reassuring. Though the gunwales are quite low, there are grabrails and you can get your toes under and lean outboard while fishing. At rest, it’s a very stable platform that leant only so far when three of use stood on one side. This bodes well for offshore work and family fun runs with a pile of kiddies aboard. According to my handheld GPS and observations, the hull planes at 7.5 knots at 3000rpm with full outboard in-trim, holds a low speed cruise of 14 knots with half trim, and cruises in the zone at 4000rpm and about 18kts. Fast cruise was clocked at 25kts at 5000rpm on the bay and top speed at 6000rpm was 31-32 knots. But around 4200rpm and 20 knots felt best. 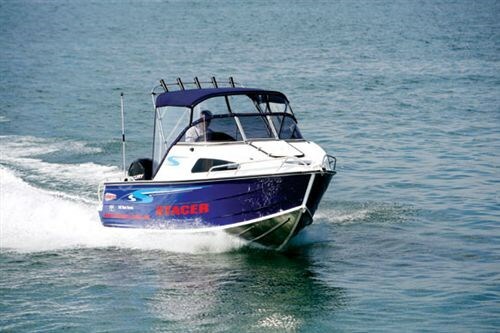 Although Stacer's most popular models are the 549 Easy Rider - a bowrider - and the 469 Sun Master - a runabout - the 549 Wave Runner deserves a look. After all, half cabins have been around since the year dot and, if nothing else, are practical, time-proven, tried and tested. Price as tested: $48,640 w/ Mercury 90hp four-stroke outboard, Stacer V-Loader trailer and options.